While natural fibre ropes tend to stretch and degrade over time, man made polyester rope will remain strong, stable and resilient as time passes. It can cope with heavy loads, avoid succumbing to mildew and even survive UV rays for years without giving up the ghost. 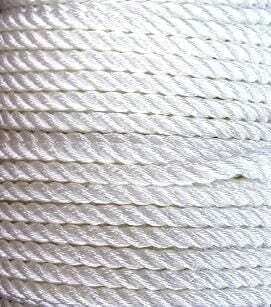 If you need polyester rope, we can supply you with as much as you require. It is a popular choice amongst our other twine and cords, since its synthetic nature allows it to withstand conditions that would leave cotton and sisal rope in a bad state. It shares many features with our polypropylene rope, such as its ability to stay safe and secure in places where moisture is present. Matched with its resilience in the face of extended sunlight exposure, it is well suited to outdoor use. The fact that polyester does not stretch is another strength, at least in certain applications. You can use it for DIY at home, or buy it to deploy in a commercial setting. It is easy to handle, while its additional thickness means that it can be used in place of narrower twine and cord products. If you are not sure about why polyester rope is a good investment, contact our team to get in-depth information about where it can be used effectively. The number to call is 01384 78004, or you can write to us via our contact page online. Polyester Rope Overall rating: 5 out of 5 based on 6 reviews.